We love hearing about treats that are a result of cross-national food pollination. One of the most fascinating examples of this is the Castella cake from Japan aka Kasutera (カステラ). Castella is a simple, light sponge cake often served in rectangular loaves and sweetened with honey. Intriguingly, the history of this simple-seeming cake is a lot more complicated: it actually arrived in Japanese via Portuguese traders in the 1500s! Unlike Macau, I don’t really think of Japan as having a lot of Portuguese influence. However, it turns out the Portuguese were in Japanese port of Nagasaki by the 16th century, and the cake, known by the Portuguese as Pão de Castile (literally “bread from the region of Castile”), was brought on these early ships. This Western-style cake really caught on in Japan, and the rest is history. We have tried Castella cake a few different places – but a good place to get it in the Chicago area is at Handsome Bakery (204 E Golf Rd., Schaumburg, IL). if you are hankering to make your own Castella, check out the instructional video below from Just One Cookbook. We were lucky enough to get Hamilton tickets in NYC this year, which brought us to the age old question – where in the worlds are we going to eat? The key to pre-theater food is that it has be quick and close to the theater – it’s a bonus if it is any good (this is harder than it may seem). Fortunately, we think we have cracked the code for pre-theater dining in NYC – ramen! Turns out there is a pocket of great ramen joints pretty near NYC’s theater district. One of the best places to go is Totto Ramen (366 W 52nd St, New York, NY 10019), or Totto Ramen Next Door (366 W 52nd St. – same address…but next door) if that is a bit too busy! The best rumored ramen in the area is Ippudo (321 W 51st St, New York, NY 10019), and you might also try your hand at getting a spot there, but we heard that the line could be epic. The name of the game at each of these places is ramen, and each is basically a walk-in. Regardless, there may be a line, even at Totto Ramen, and we had better luck going “Next Door” on a Thursday night. The menu at Totto Ramen Next Door is an abbreviated version of Totto Ramen – but all of the ramen greatest hits are there. You can order a piping-hot bowl of vegetable ramen (regular $9 or spicy $10), richer pork tonkatsu ramen, available with both shoyu or shio broths in both regular or spicy varieties ($12-14). The tonkatsu is the specialty of the house, so we knew we had to try it for ourselves. If you are really feeling peckish you can get a “Mega char siu tonkatsu” with a larger bowl and an extra helping of char siu pork ($16-17). It may have not been the most amazing ramen we have ever tried, but it was rich and flavorful, and the veggie ramen was some of the freshest and most colorful we have ever had. Plus, it may have just been the quickest and cheapest thing in the theater district aside from fast food. We walked right to our show after grabbing a bite, which took less than 45 minutes, all told. So do away with all of the fuss and expensive pre-dinner packages and just get yourself some ramen! We are happy that authentic Japanese ramen has exploded as a trend in the US, and now you can find great ramen in most US cities. If you’re looking for the starting point of this wave of ramen in Chicago, you have to go out to the northwest suburbs, where Ramen Misoya (1584 S Busse Rd., Mount Prospect, IL 60056) was the first authentic Ramen-Ya (ramen restaurant) in the Chicago area, starting in 2013. Little did we know, but Ramen Misoya is actually a chain, with a few locations throughout the US and Japan, and now a downtown Chicago outpost (213 E. Ohio St.). Despite the influx of ramen restaurants in Chicago, one of our favorites is still Ramen Misoya. Ramen Misoya is a tiny place with maybe only 8 tables, and a small amount of counter seating, so get there early. The menu may seem overwhelming at first, but there are 3 main varieties of broth to choose from, and you can get 5 versions of meat and vegetable toppings for each broth. The three miso-based broth options are Kome, Mame and Shiro: the Hokkaido-style kome ramen is made with a rice-and-soybean miso, and is the darkest and most full-bodied; the Nagoya-style mame is slightly bitter; and the Kyoto-style shiro is the lightest miso variety of the trio, and was described as having a fruity flavor. All ramen comes topped with ground pork, green onions, sprouts, and menma (fermented bamboo shoots), but with each broth you can can choose from assorted vegetables, Cha-Shu pork, spicy and kimchi varieties ($9-$13 depending on the toppings). There are also a few special varieties of ramen including the creamier, richer Tokyo miso pork tonkatsu ($9.50) and the Kyoto miso tan-tan sesame ramen (above – $9.90). One of the best part of the ramen is that you get to customize your bowl with extra toppings including tonkotsu fried pork, extra noodles, nori sheets a, miso egg, or even a pat of butter (all for small extra charges). We like to start out with a small assortment of appetizers including a tasty gyoza dumplings ($4.5) and chicken kaarage (fried chicken, $3.50 small, $7 large). We have tried all of the different broths, and each one has been delicious, though we think our favorite may be the special sesame broth, which you can not get at many other ramen places. Ramen Misoya excels at everything from start to finish: the noodles are also delicious – toothsome and springy – a perfect complement to the broth. The portion size is pretty big, too, and one bowl of ramen usually lasts us two meals. As an added plus, you can also get one of our favorite Japanese desserts there – taiyaki – a fish shaped waffle-like treat filled with sweet red bean paste. If you are looking for great ramen at the place that kicked off the ramen craze in Chicago, definitely visit Ramen Misoya. Kit Kat, the chocolate-coated wafer candy from Nestle, is experience a bit of a publicity resurgence in the US, due to a popular series of quirky ads featuring Chance the Rapper. However, nowhere is Kit Kat more popular than in Japan, where the humble Kit Kat bar is only a jumping-off point for fanciful flavors and gourmet Kit Kat creations. Kit Kat was introduced to Japan in 1973, and has since become ubiquitous convenience store treat, as well as a popular gift for students and a present for friends and family when traveling. In Japan, the different flavor varieties of Kit Kat are seemingly endless – there are nearly 300 – including anything from strawberry cheesecake to plum to wasabi. Now there’e even a Sake-flavored KitKat. When we visited a candy store in Chicago’s Chinatown, we were able to sample the sweet potato and green tea Kit Kats. The sweet potato flavor basically tasted like white chocolate, but the green tea flavor was really excellent! If you are hankering for some unique Japanese-flavored Kit Kats, check out Amazon – you can get a variety pack, or pick up bags of esoteric flavors like Pumpkin Pudding. And just when you think it couldn’t get any weirder – enter Kit Kat sushi! We love this Japanese candy advertisement wishing us a happy new year (in 1956) – we hope you have a Happy New Year, too! This crazy week has left a lot of people, the eaters included, in need of a smile (and some food therapy). And we have found a light-hearted dish that may put a smile on your face: Taiyaki. Taiyaki is a Japanese dessert cake shaped like a fish (“taiyaki” means baked/fried fish in Japanese) and filled with red bean paste. Made with pancake-like batter poured into a fish-shaped mold, taiyaki is commonly sold as a street food or festival snack. This fishy dessert has been around in Japan for at least 100 years, though others argue that its roots can be traced to imagawayaki, a non-fish shaped cake with the same flavors that has been around for centuries. Though taiyaki is largely unknown in the US, it is starting to make some waves at Taiyaki NYC, an ice cream shop where the taiyaki is used as a cone. We’re adding that to our NYC food list! You can make Taiyaki yourself at home if you have the right pan, but what’s the fun in that? Emojis have saturated our texts and tweets, and everyone is familiar with perennial food favorites like the coffee cup and the bowl of noodles. Some food emojis are more esoteric, however, and we needed a little help to decipher them (most are Japanese snacks that are not as common in the US). However, Bon Appetit may have just uncovered the most esoteric food emoji of all: an emoji with a moon, grass, and what appears to be a basket of eggs. However, this emoji actually references a fall Japanese moon-viewing ceremony, Tsukimi. And the basket doesn’t contain eggs, it is full of mini mochi (rice cakes)! Tsukimi is celebrated to honor the autumn harvest, and includes food, drink and tables covered with tall grasses, and bowls of mochi and chestnuts. Yum! We are serious about our coffee (well at least one of the two of us is) so we were extremely excited to hear about the opening of Sawada Coffee (112 N Green St, Chicago, IL 60607). The small coffee bar, which is actually located inside of the BBQ spot Green Street Smoked Meats, is a collaboration between restaurateur Brendan Sodikoff and master Japanese coffee impresario Hiroshi. Sawada founded Streamer Coffee Co., a darling of the Tokyo coffee scene, and is also a world latte art champion. With a pedigree like that you have to figure the coffee is probably going to be pretty serious. The selection of drinks at Sawada is relatively small, but there are some notable choice like boozy steamers, and the signature drink of Sawada, the Military Latte. The Military Latte, which just may be one of the most photographed drinks in all of Chicago (which we are contributing to, of course), is basically a mashup of a mocha, a matcha green tea latte and a shot of espresso. It sounds kind of bizarre, but tasted divine, and looks even better. The more standard coffee drinks like cortado and cappuccino at Sawada are also crafted with care, and the knowledgeable baristas are friendly. There are few seats around the window by the coffee bar (and at the ping pong table) but the traffic also seems to overflow into the Green Street Smoked Meats area, so there is a bit more room. If you are feeling peckish they even offer Doughnut Vault doughnuts. Move over pumpkins, its persimmon season! We did not grow up eating persimmons, and our first experience really eating this Japanese fruit was in Brazil, where they are called caqui (the Japanese word for persimmon is Kaki). Persimmons were brought to the US from Japan in the 1800s, where they are considered the national fruit. As we began diving into the world of persimmons, we were intrigued by the differences between the varieties. There are two major persimmon types in the US (and many more in Japan and other areas) the Hachiya and the Fuyu. Their texture and preparation differs widely: the acorn-shaped Hachiya can only be eaten when extremely ripe, while the Fuyu can be eaten at any stage. One step further for persimmon aficionados is the hand-massaged and dried hoshigaki persimmon. So lets get cooking: The Kitchn has 10 seasonal persimmon recipes, or try an amazing looking bread or a savory persimmon caprese. It may just be the end of an era. The main wing of Toyko’s most famous modernist hotel, the Hotel Okura, is now closed, and is in the process of being demolished. Watch this video from Monocle to get an idea about the distinctive design of the Okura, originally built in 1962, with more photos from Curbed. The restaurants and bars in the hotel were also iconic, particularly the Orchid Bar, which looks like the perfecet setting for any James Bond film or diplomatic meeting. I remembered the Hotel Okura instantly from “Walk Don’t Run,” a charmingly bizarre movie about the 1964 Summer Olympics in Tokyo (starring Cary Grant). Muracci’s (307 Kearny Street, San Francisco, CA 94108) was on our shortlist of places to try in San Francsico for a long time, so when I had a work trip there, I jumped at the chance. We were intrigued by the concept of Japanese curry, a version we had never tried before, despite being extremely well-acquainted with Thai and Indian curries. Legend has it that the dish was introduced to Japan by the British in the 1800s (when India was still a British colony). It is definitely not an elegant or refined dish, and is generally seen as “home cuisine,” and is not commonly available in Chicago Japanese restaurants. When we went to the counter to order we noticed the large 64-plus gallon vats of curry stacked on the side of the counter, which we took as a good sign. You can order 3 strengths of curry: mild, medium and hot. There were several varieties of meat that could be topped with the ubiquitous crurry – and the chicken katsu ($10.25) and pork tonkatsu ($10.25) seemed to be favorites, though you could also get prawns, salmon, beefs and veggies. I went with the medium-spice chicken katsu, which was a chicken breast, pounded flat and breaded, served with choice of rice, slaw and pickles. Other non-curry options included chicken teriyaki, hot curry noodle soup and homemade mochi. There is really nowhere to sit in the counter-only postage stamp-sized shop, and they did a brisk trade in takeout. I did particularly enjoy the miniature shrine with a cow they had set up right by the cash register. I took my meal back to the hotel, where I unpacked the little Styrofoam container, which had the curry in a separate tub – which was nice because you could add as much or little as you wanted. The curry was delicious and fragrant, with similar spaces to a mild Korma curry, heavy in garlic and onion. It was a perfect compliment to the juicy boneless fried chicken. This curry was a great, quick filling meal, and a new taste of Japan. We are itching to try some Japanese curry in Chicago, and Time Out found a couple of spots that serve this rarer dish. Another option is to make it at home, using “curry roux” pre-formed blocks, or even from scratch. Pourover coffee is having a moment, but now Starbucks in Japan is taking it one further with their “origami” single use pourover kit. Seems like a pretty cool way to brew coffee, and we certainly prefer it over the more common single-serve coffee method of K-Cups or freeze dried coffee powder. What do you think – would you use origami? 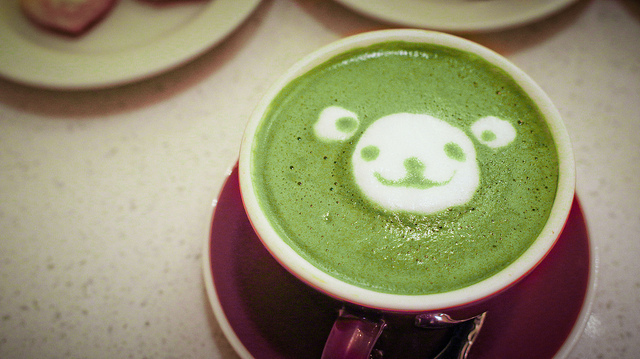 Will 2015 be the year of Matcha? Bon Appetit certainly thinks so. We have always been fans of matcha – powdered Japanese green tea, so we are look forward to seeing it become more popular in the US. From lattes to cupcakes to sugar cookies, matcha is good in everything. While we have always enjoyed Japanese cuisine, we don’t consider ourselves experts. But we do consider our friends R & R to be Japanese food experts, given their years of experience in Japan and a passion for Japanese food. They recently opened out eyes to a whole new dish when (just as the weather turned colder) they invited us over for some Nabe (or nabemono 鍋物, なべ物), a warm, hearty, wintery stew. Nabe’s name derives not from its ingredients but from the pots used to make it (donabe), which also are heated to keep the dish warm on a portable burner after it has been served. A true stew, nabe can be made with pretty much anything you have a taste for. Typically this begins with special nabe broth, which can be purchased pre-made in packets in a variety of flavors. One then adds veggies and many add-ins along with a dipping sauce, which are then cooked with long metal cooking chopsticks. A particularly hearty chicken and fish nabe is also known as “sumo nabe,” Chankonabe (recipe here), since it allegedly helps sumo wrestler pack on the pounds. The nabe R & R made was composed of a spicy kimchi broth, cabbage, carrots, noodles, mushrooms and meatballs, and was delicious, hearty and filling. You also use the leftovers to make a fried rice dish, which was amazing. Our first taste of nabe made us hungry to try more in the future. Spicy pork and seafood nabe sounds good, no? Thanks R & R, for introducing us to the vast world of nabe! [Via Metafilter] We recently came across an absolutely fascinating video depicting a master fake food maker in Japan. That’s right, FAKE food, known in Japanese as sampuru, which is derived from the English word “sample.” In many restaurants in Japan, as well as Japanese restaurants abroad, enticing fake food is put on display to give potential customers an idea of what they will get. Creating the food itself is an art, and sometimes it’s even a little hard to tell real from fake. [Video via Kottke] We spoke recently how authentic ramen restaurants were becoming increasingly popular across the US, and that trend has no sign of slowing down. Some of these restaurants make noodles in-house, but many buy them. Check out how fresh ramen is made for some of the most popular ramen eateries across the US, at Sun Noodle. Our World Cup coverage continues with an unexpected cross-cultural treat from Japan. Okinawa, Japan may not be first place you think of when you think of ice cream, but it turns out the island is crazy about it! Ice cream came to Okinawa with American troops in WWII, but became a trend that lasted much longer. The main purveyor is Blue Seal, originally founded to provide troops with a taste of ice cream from home, but eventually the ice cream became available island-wide, where it has gained quite a following. There are flavors that Americans would be familiar with, as well as Okinawan flavors like sugarcane, bitter melon and purple sweet potato. Blue Seal-branded cafes are found all over Okinawa, and now even in Tokyo, too. Softserve is more popular in Japan, but Blue Seal definitely holds the top spot for American-style ice cream. When the word “ramen” comes up, your first thought may be of the ten-for-a-dollar deals your local supermarket had on instant ramen in college. However, there is a lot more to it than that, and the traditional preparations of this Japanese soup dish are catching on in the US. Food and Wine has a profile of Ivan Orkin (with recipes) about how he and other chefs are reclaiming ramen’s good name. There are ramen shops popping up all over NYC and Chicago, and Serious Eats Chicago ranked suburban Mount Prospect’s Misoya as the top ramen in the area. 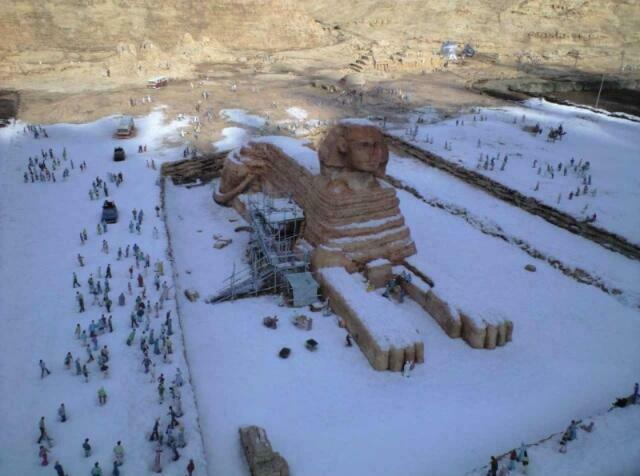 Happy winter wishes from the miniature snow-covered Sphinx in Tobu World Square Theme Park in Japan. Pingmag has a fascinating article about mujin hanbai, or “honor stores,” a type of farmstand in Japan that relies on the honor system. The simplest of these just has a locked cashbox, while others more resemble vending machines. They are popular nationwide, even in Tokyo. I’ve seen a few honor roadside farmstands before (one even boasting “self-serve rocks”), but nothing so elaborate as those found in Japan. Have you ever encountered something like an a honor store?